(1986) "If She Knew What She Wants"
(1986) "Walk Like an Egyptian"
"If She Knew What She Wants" is a song by Jules Shear released on his 1985 album The Eternal Return. The song was recorded a year later by The Bangles for their 1986 album Different Light. Shear's song originally was written in the first person as a love song; the Bangles rewrote the lyrics in the third person rather than change the subject's gender. 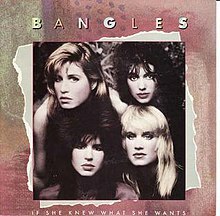 The Bangles charted at number 29 on the Billboard Hot 100, number 31 on the UK Singles Chart, and number 31 on the Australian Kent Music Report chart. In Canada it peaked in its' 10th week on the RPM 100 Singles chart at number 29 on July 26th, 1986. Two different music videos were created for the song, one that was commonly shown in North America and the other that was commonly shown in Europe. The "American version" was produced by Tamar Simon Hoffs, the mother of Bangles guitarist/vocalist Susanna Hoffs, who sings lead in this song. The Bangles version is featured in the 2006 Tim Allen and Courteney Cox superhero comedy Zoom. ^ Kent, David (1993). Australian Chart Book 1970–1992 (Illustrated ed.). St Ives, N.S.W. : Australian Chart Book. p. 26. ISBN 0-646-11917-6. N.B. The Kent Report chart was licensed by ARIA between 1983 and 19 June 1988. This page was last edited on 7 February 2019, at 16:38 (UTC).